Hi Friends - Penni Shelton here. I wanted to let you all know that I'll no longer be blogging here at Real Food Tulsa, but I plan to leave the existing content available. 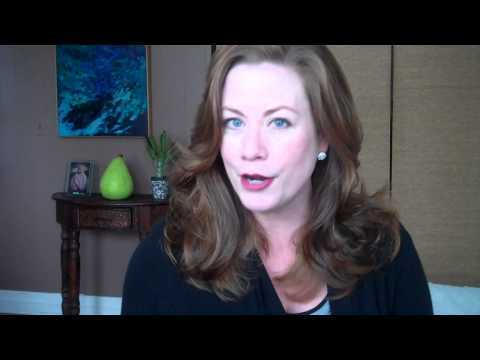 I love staying in regular communication with many of you over at Real Food Rehab (formerly Raw Food Rehab) and on other streams of social media. Please come connect wherever you have interest! I'm just checking in with you in these few remaining hours of 2013. I hope you've had an enjoyable holiday so far and that you are looking forward to a beautiful new year ahead! I've been taking some precious time to be still, re-focused and have been doing a bit of writing & content creation for my new website and community site UpgradedEats! I wanted to say how grateful I am to each of you who are still subscribed here, to to those who stay connected and have the desire to stay plugged in with me as I forage ahead into new territory! If you haven't already, I'd be delighted if you'd stop by my new website and sign up for my monthly newsletter. I'll be sharing lots of delicious tidbits, (like the recipe for the Tropical Mango Turmeric Tango you see above) and anything else I think you might be interested in regarding taking your health & wellness to a more upgraded level! I'll be leading a guided 10+ Day Mind Body Reset at UpgradedEats beginning January 6th. With the $10 monthly subscription, members get full access to everything - education, inspiration, support and the guided 10-Day January Reset - all materials, recipes, daily videos, etc. are included in the subscription fee. I will also be adding a free ebook to www.upgradeyourplate.com very soon - so be sure to subscribe to Upgrade Your Plate's monthly newsletter so you won't miss that! I just want you to know how much I appreciate you and am so grateful for the opportunity to be connected with you on whatever level resonates with you. I wish you many blessings and a bright, vibrantly healthy 2014! 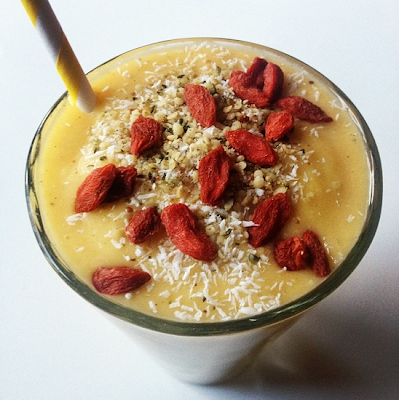 I added a little hemp seed, shredded coconut & some gojis to the top to serve - it's a good one! I want to genuinely thank you for following Real Food Tulsa, and for many of you, being a member of my Raw Food Rehab Community website. As you may have already heard, I have shifted my energies and have launched a new support community for those who are interested in upgrading their health & wellness on all levels and in all areas of their life! In the new space, food is only one of the focuses of true health and it is a place with no imposed rigid rules or dietary dogmas. I still believe in the power of raw REAL foods to heal and rejuvenate the body, but do not believe that one must eat an exclusively raw diet to achieve a brilliant level of health. This is a delicious vegan soup that the whole family can enjoy! Trim the tough ends of the asparagus and cut the remaining stems into approximately 1 inch pieces. Toss with the garlic, a tiny bit of melted coconut oil and salt & pepper. Spread onto a baking sheet and roast in a 400 degree F oven for 20 minutes. While the asparagus is roasting, add a teaspoon of coconut oil to a large sauce pan or small stock pot and sauté the shallots and leeks (or scallions) until lightly brown and soft. This is when I added a cup of white wine to help deglaze the bottom of the pot, but you can use some of the veggie broth or plain water to do that. Continue cooking, reducing the liquid by about half. Add the roasted asparagus and garlic cloves and the rest of the vegetable broth and bring to a boil. Reduce to med/low heat and cook for another 15 minutes. I used an immersion blender to puree the soup, but it could easily be done in a couple of batches in a blender. Add to the pureed soup 1/2 cup of full-fat coconut milk (cream) and stir in to incorporate. 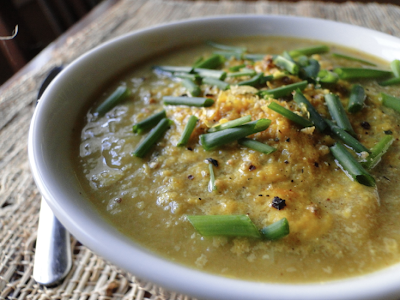 Serve the bisque with a topping of nutritional yeast and chopped chives, if desired. I am fully into fall this year. I guess the truth is that I am into it every year. The sights, sounds, temperatures, sensations and flavors of the season are always inspiring to me. Today I was messing around in the kitchen and put together a few ingredients that turned out really delicious and I thought I'd share it. 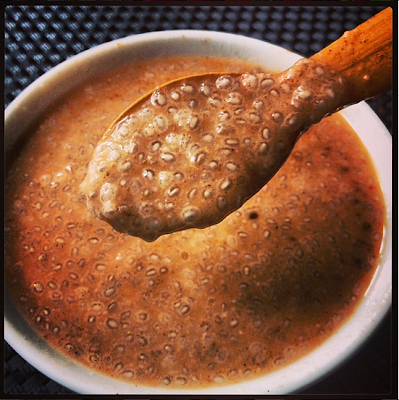 It's super easy to make this before bed so you can enjoy it for a super fast and nutritious breakfast! I combined all these ingredients into a glass jar, sealed tightly, shook until well blended - then I put it into the refrigerator for 30 minutes to congeal. It is so yummy & it will be my breakfast tomorrow morning! Let me know if you make it or if you have another favorite combo along these lines that you really like! 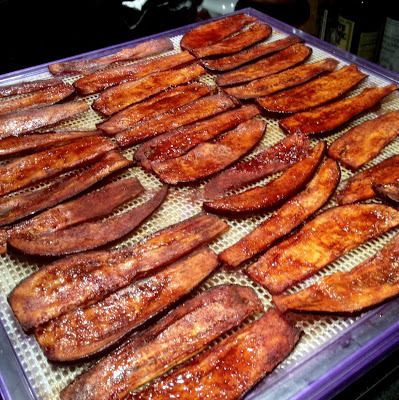 It's been a couple of years since I made Eggplant Bacon. I absolutely loved it then, so I'm not sure why I waited so long to recreate it. Perhaps it's because I remembered thinking it was fairly high in fat. I had made it in the midst of summer when eggplants were fairly prolific for a delicious BLT sandwich (you can view the recipe here). So this time, when I got a hankerin' for vegan bacon, I decided to be a little more thoughtful about the ingredients, and the finished product did not disappoint! I would recommend using a mandoline if you have one, which I do, but I cut my eggplants free style with just a cutting board and a knife and they came out just fine! The goal is to cut them very thinly, but remember that they will reduce when you dehydrate or bake them. Whisk together all ingredients in a medium bowl until well combined. 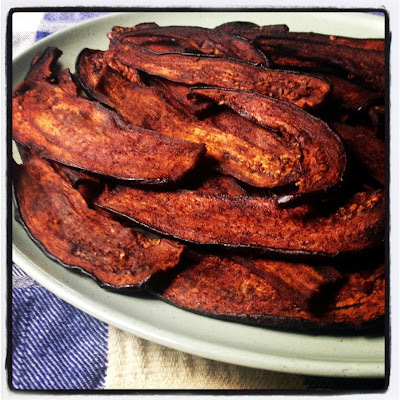 Fully coat each eggplant slice and lay into a 9 x 13 baking dish to marinate. Pour any remaining marinade over the top and cover with plastic wrap for at least one hour. Transfer slices onto mesh dehydrator trays and warm at 135 degrees for the first hour. After one hour, I flipped the slices and brushed on the reserved marinade to re-coat. Return to the dehydrator, set now at 115 degrees to finish, approximately 8 -12 hours, depending on what level of crispiness you prefer. If you don't have a dehydrator, place slices on parchment lined cookie trays and bake at 350 degrees F for about 30 - 45 minutes, brushing occasionally with reserved marinade. 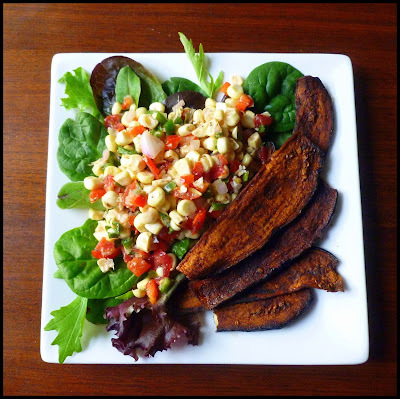 The bacon was my delicious lunch today, served with a raw corn salad (recipe in Raw Food Cleanse or available online in this post). Getting my bacon, lettuce, corn & tomato on, even if it is the middle of winter! Fall Into Raw with Me!